Cardiff council will formally bid to host part of Channel 4's business when it relocates from London, BBC Wales has learned. A letter from its leader to the broadcaster's chief executive confirms it will attempt to secure one of three production centres. 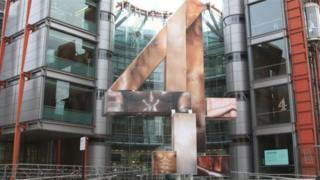 Channel 4 has announced plans to relocate 300 staff and create three hubs outside London. It will also increase its spending on shows made outside the UK capital. In the letter, seen by BBC Wales, council leader Huw Thomas said Cardiff "would be delighted to present its credentials" to chief executive Alex Mahon. Mr Thomas said: "I have no hesitation in taking this opportunity to confirm to you our intention to bid to secure one of the new creative hubs. "This is based on Cardiff's widely acknowledged strengths as a nationally-significant centre of broadcasting and cultural excellence." The letter lists qualities including the city's "booming creative industry sector," its comparatively low office rent prices and its expanding population. It cited BBC Wales' decision to build a new headquarters in the city centre as part of the council's "unrivalled track record of delivering major investment projects, helping deliver outstanding results for organisations wishing to locate in the city". Cardiff had previously joined the Welsh Government in calling for Channel 4 to move to the city in its response to an initial consultation on relocating the broadcaster's London headquarters. Productions for Channel 4 have recently been filmed or partly-shot in Wales, including the drama series Kiri starring Sarah Lancashire. Channel 4 will begin inviting cities to bid to host its new creative hubs from April 2018, with a decision on their locations expected by September.